Nick bemused, originally uploaded by palinode. Paul, on a guitar grunge-god jag, finally irritates Nick. In the background and just off-centre, Shannon and Jeff believe they are posing for the picture. 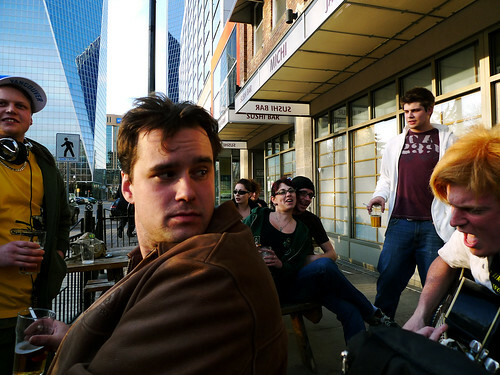 Even though this shot of full or random flyaway details (not to mention two sketchy dudes standing around with beers), Nick's expression completely dominates. My LX3 is teaching me to enjoy wider-angle lenses. I could never have captured this in a frame with my G10 or my old FZ8. I suppose I could buy a wide-angle lens for my SLR, but film has come to seem archaic, inconvenient and an unnecessary expense these days.